When you want something done, ask a parent. Okay, that's not the actual saying but it should be, just ask mom Tiffini Wissing Hein whose transport service has added a whole new level to safe school transport. Seeing big 7-seater mom's taxis filled with uniform-clad children has become somewhat of a norm these days. Lift clubs are a definite convenience for parents who save fuel and time by taking turns to take a bunch of neighbouring kids to school. Other parents have taken to sending their kids to school in Ubers, sometimes booking the same dependable driver. But just how safe are these modes of transport? Can you trust the other parents or taxi drivers, are your kids strapped in and have all possible safety standards been met? Then there’s the fact that no parent wants to think about: in South Africa, road accidents make up one-third of all injury-related deaths among children under the age of five years. These questions and considerations motivated Tiffini Wissing Hein to create a safer, reliable and affordable option for parents. 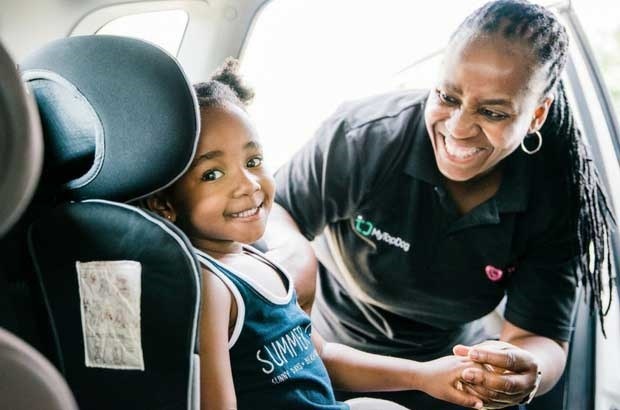 Cool (kids’) Cabs first got its start in Johannesburg, Tiffini’s home base, eight years ago and it has since upped the ante with vehicles equipped with onboard cameras, full three-point seat belts and a line-up of all female drivers. Parents who use the service can also expect 24/7 tracking, with SMS notifications when their child is picked up and dropped off and a special monitoring team which tracks all their vehicles on the road in real-time. We asked Tiffini to tell us more about her service and the plans to expand. Tell us about Cool (kids’) Cabs, how did the idea come about? Having started a recruitment firm specialising in au pairs, I quickly realised the gap in the market for a safe and reliable transport service that was customised to parents’ needs and schedules. While many families didn’t need an au pair (they had a wonderful, experienced and trusted nanny in place already), they were being compelled to seek one purely to fill the transport gap. It was apparent there was a need for something new – something that completely exceeded anything else on the market, and gave parents absolute peace of mind that their children were in safe and trusted hands. And so the idea of a lady-driven cab was born. It quickly grew to a highly experienced, extensively trained lady driver, in a vehicle that was being internally monitored in real time by both tracking and onboard cameras. Cool (kids’) Cabs is expanding its reach – which parts of the country will the service be available to? We are currently available in Joburg, Centurion and Cape Town. Pretoria is launching soon, with routes already taking bookings. We hope to expand into the North Coast of KZN in early 2019. Our quoting system is available at www.coolkidscabs.co.za. Once a quote is accepted, it is as simple as awaiting feedback from our schedule team to onboard a child. This depends completely on the type of service utilised. Our ad hoc service is our most expensive option, with monthly return lifting being the cheapest per kilometre rate. Our rates work in bands, on a sliding scale. You’re a mom, how many children do you have and what are their ages? I am mom to Sophie-Mae (5), Harvey (4), Baby C (1), Baby M (7 months) and Baby T (10 weeks)***. ***Note: The youngest three are in foster care and place of safety with Tiffini. What are your safety concerns when it comes to school transport? Has your child ever had a bad experience? Tell us your story by emailing to chatback@parent24.com and we could publish your letter. Do let us know if you'd like to stay anonymous.